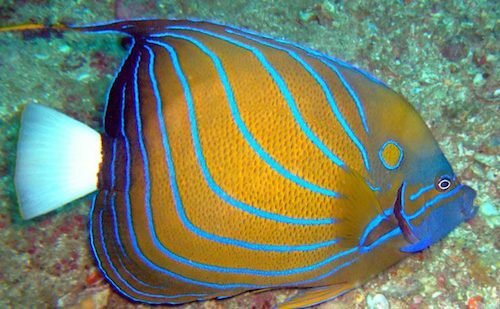 The Blue Ring Angelfish or the Annularis Angelfish (Pomacanthus annularis) is named for the bright blue rings or stripes that circle its orange/yellow body. Like many species of saltwater angelfish, the young blue ring angelfish look nothing like what they do once they reach adulthood. As juveniles, they are black with blue and white vertical stripes. In the wild, the blue ring angelfish is found in the East Indies, but its territory extends from the coast of East Africa to northern and southern Japan. They typically inhabit coastal waters and swim at depths of about 10 feet. The Annularis Angelfish is a larger variety of saltwater angelfish and grows to about 17 inches. They’re reasonably hardy and most intermediate to advanced hobbyists should have little trouble successfully keeping this fish. Because the blue ring angelfish grows to such a large size, you’re going to need a large tank of at least 180 gallons although many experts say 250 – 300 is preferred. They also say that giving this fish a properly sized tank is important because putting them into a too small enclosure can stunt their growth and shorten their life span. The blue ring angelfish can be aggressive when defending its territory, which is another reason to pay attention to the size tank you’re putting them in. Additionally, this fish is a very active swimmer so you’re going to have to give it plenty of open swimming room. If you’re getting this fish as a juvenile, make sure you have plenty of places for them to hide as they can be quite shy in a new environment. Once they’re comfortable, however, they will begin to swim freely provided they’re not placed in a tank with overly-aggressive tank mates. Their preferred water temperature is 72 – 82˚ Fahrenheit with a pH range of 8.0 – 8.4, medium hardness, and a specific gravity of 1.023 – 1.025. As with most saltwater angelfish, the blue ring angelfish is sensitive to changing water conditions, so you’ll want to stay on top of maintaining perfect water quality. Experts recommend water changes of 20% per month or 10% every other week. Small water changes are preferable as they tend to keep the pH from changing rapidly. Tank decorations should include plenty of rocks and corals to give the young places to hide when they feel threatened or stressed. In the wild, sunlight is important to help these fish process the vitamins they get in their diet, and you’ll need to provide good lighting at home to keep these fish happy and healthy. In addition, in their natural habitat the blue ring angelfish is used to stronger currents so try to create a space in the tank where you can replicate this water movement. 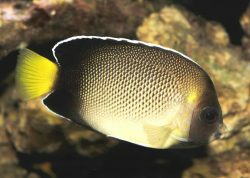 Like other species of saltwater angelfish, the blue ring angelfish can easily pick up diseases that are common in the home aquarium. Stress is the number one contributor to these fish getting sick, so you’ll want to do everything you can to make sure this animal remains calm. Stress comes from multiple sources, such as housing them with overly aggressive tank mates, not providing them ample hiding places, inappropriate diet/nutrition and sudden changes in water quality. 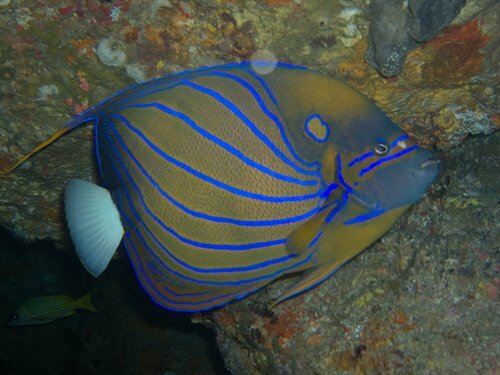 As with most species of saltwater angelfish the blue ring angelfish is particularly susceptible to Crypt (Cryptocaryon irritans)) also called Marine Ich or White Spot Disease. You can spot the onset of this disease if the fish starts “scratching” against the rocks. Another common disease that affects this fish is called Marine Velvet (Oodinium ocellatum). This is a parasite that causes a “valet” coating to appear on the skin. 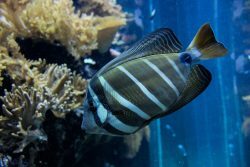 As with most saltwater angelfish, these diseases can be difficult to treat, so the adage ”An ounce of prevention is worth a pound of cure” applies here. While that all may sound grim, disease is easily avoidable if you take proper steps to ensure this fish gets the proper care, is set up in the proper environment and gets a healthy diet. If you do that there’s no reason your blue ring angelfish shouldn’t live 10 years or longer. Blue ring angelfish are omnivores and in their natural habitat they feed on encrusting invertebrates such as sponges and tunicates. They are also fond of zooplankton, which they like to pick out of the water column. In the home aquarium they will accept all types of food, but be sure to give them variety in their diet and include sponges — either live or commercially available mixtures containing sponge — flakes, shrimp and tablets. You can also give them live treats such as shrimps and worms. It’s recommended that adults be fed twice a day and juveniles be fed three to four times a day. These fish are very active feeders and will often come up to the surface to get a meal. 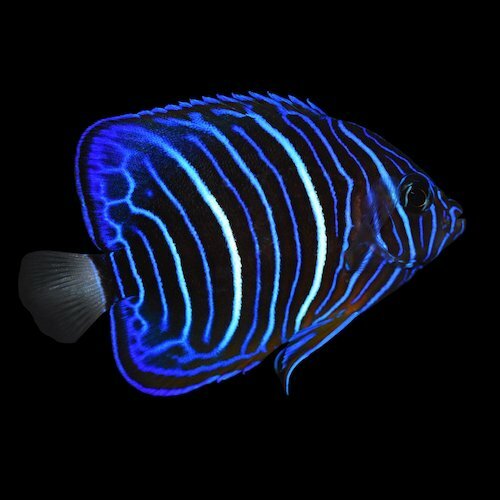 Breeding the blue ring angelfish in captivity isn’t as difficult as with other species of saltwater angelfish, but it isn’t common either. Most reports suggest that the larvae rarely survives. In the wild these fish will either permanently pair up or form harems depending on the location. 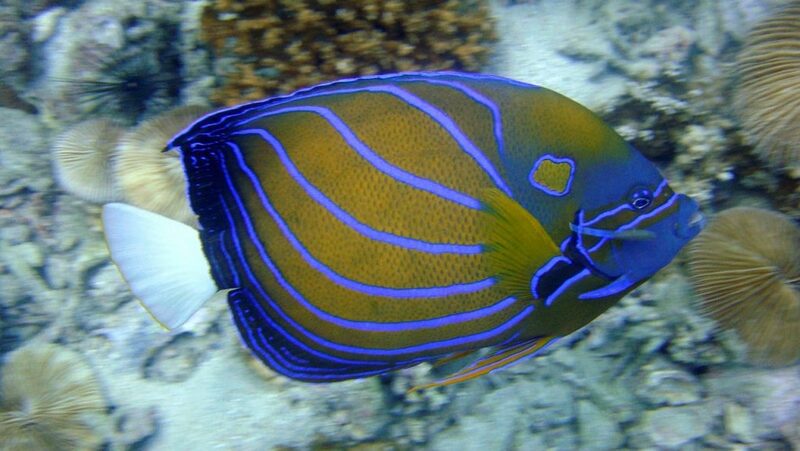 The blue ring angelfish or annularis angelfish is a beautifully colored and active saltwater angelfish. Their large size makes for an impressive living display in the home aquarium. 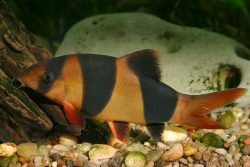 They are a moderately hardy fish that the intermediate to advanced hobbyist should have no trouble caring for and keeping alive. With proper care, diet, water quality and the right tank mates, there’s no reason this fish shouldn’t provide you with many years of pleasure.